BPA has strong ties to Auburn—several members of the BPA family graduated from Auburn University, support its various athletic teams, and consider the Loveliest Village on the Plains to be a second home. For our team, it is a great privilege to work on a project at our old stomping grounds for our alma matter. The Hotel at Auburn University & Dixon Conference Center is a notable landmark for anyone traveling along South College Street through the Loveliest Village on the Plains. 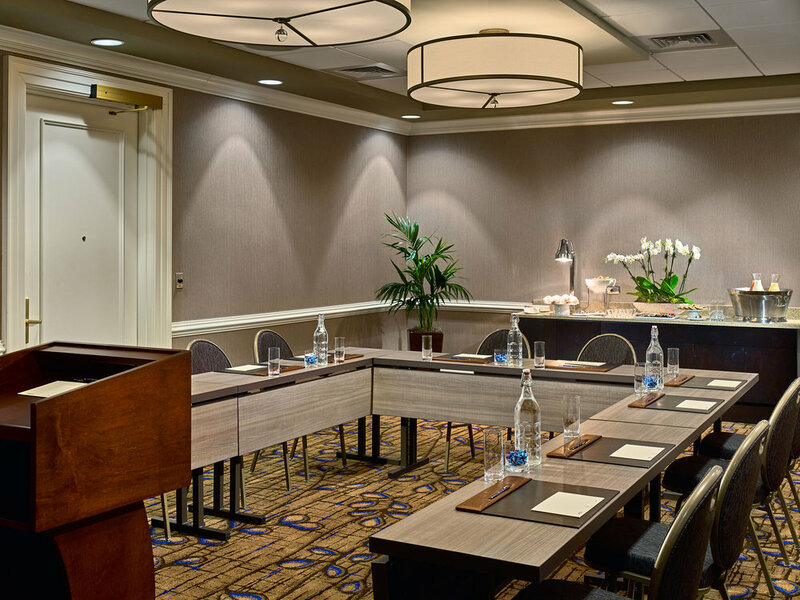 Last year, The Hotel debuted interior upgrades for its world-class conference center. Strategic construction phasing was necessary to facilitate the extensive renovations while allowing the hotel and conference center to maintain operations. BPA has been working on something close to our hearts - a cultural arts center for Mentone, Alabama. As designers, we are honored to help develop this design that will support and encourage the arts and art education in our state! Click here or read below to hear about the vision behind this project from the Mentone Arts Cultural Center (MACC) Board. 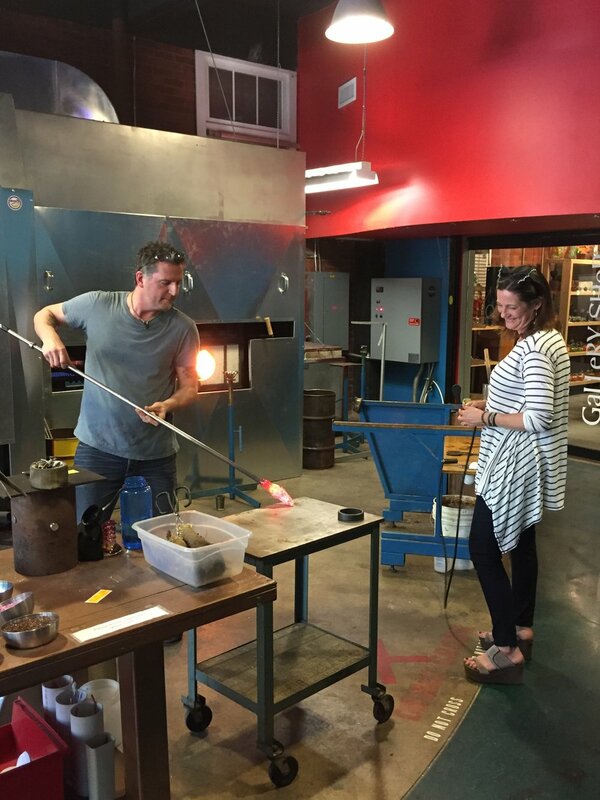 "Art and music are woven into the very fabric of Mentone and the Lookout Mountain region." "The mission of the Mentone Arts and Cultural Center is to provide education about this rich history in order to promote, propagate and protect it for current and future generations. Creation of the Center has been a long-time dream of many in this mountain hamlet. Plans are beginning to materialize that will ensure the reality of this dream. The facility will be designed and constructed for the general public of Mentone. Mentone itself is home to approximately 450 residents, but swells in size on weekends and throughout Spring, Summer and Fall as part-time residents and tourists come to the mountain. There are over 15 boys and girls camps that bring families from all over the country during the summer months. In addition, over 250 artists - known regionally, nationally and internationally - reside in the area and significantly contribute to the cultural fabric of the community. a sculpture garden which will feature native plantings, seating areas, and a life-size sculpture of Sequoyah which is being crafted by bronze sculptor Carl McCleskey and his wife Betsy Scott. This month we thought it would be great to feature one of our favorite architects and Associate Principals, Alan Crotwell. Most would describe Alan as hardworking, fun, sincere, and the "go-to-guy" in the office. One can usually find Alan at his desk feverishly working on a Revit model, talking on the phone with his clients, discussing soccer or beer, or helping someone in the office with a problem. He's currently leading one of the largest projects in the firm's history, and he's the perfect project architect to do so. He's detail oriented and doesn't hesitate to jump in to solve a problem. In addition to being a wonderful project manager, architect, and part owner of the firm, he's a husband, father to two boys, and helps out with Boy Scout groups and soccer teams. We're excited that Alan took a moment out of his busy schedule to answer a few questions for us. We were surprised to learn a few new things about him as well. What made you choose architecture? "I was always fond of building as a kid. We spent our summers building tree forts and hideouts from scrap wood. I never designed anything that we built, but I always had the idea in my head from the start. In middle school and high school I really enjoyed art classes and took as many as the school offered. To be honest though, until my junior year, I really never put the pieces together until my guidance counselor mentioned that it might be a good fit for me. I applied to the program at Mississippi State and was accepted as an incoming freshman. I was apprehensive after I realized the time involvement but I stuck with it and I was glad I did." Have you ever had any other career in mind? "Of course. I thought about Engineering, or being a contractor, but neither of those careers would have fed my creative side." What sort of music do you listen to? "I like a lot of different music. Alternative, Rock, Southern Rock, older country music and a little Rap also." What was your first job? What did you learn from it? "My first job was cutting grass and raking leaves for several of my neighbors as a kid, but I don’t count that. The first real job I had was a stock boy and cashier at Big “B” drugs at age 16 in Tuscaloosa, Alabama. It allowed me some independence and instilled a healthy work ethic in me. It was a good way for a kid to branch out and learn how to interact with customers." What’s the simplest thing you ever learned to do? "Develop an effective or efficient use of my time." Where would we find you on a typical Saturday? "Either playing with my kids, watching them play sports, playing a little golf or watching some college football. I often find myself in the middle of an overwhelming project around the house also." What is your favorite vacation spot? "Because I don’t get to go any more than every few years, I have to say the mountains. I love to snowboard so any mountain with snow works." What traits do you most value in your friends? "Loyalty, honesty, generosity and humor." What scares you? "I am not a fan of tight spaces." Who is your role model and why? "I have many roles models. My father is a big influence in my life. He has all of the qualities that I mentioned previously. I have learned though that most people in my life hold a special trait that I admire. I try to learn from those people and use it to better myself." Greetings loyal BPA blog audience! We express our sincerest apologies for keeping our faithful readers in the dark about our exciting projects. One of those is the renovation to UAB’s School of Optometry building. A significant portion of the work has already been completed, with the remaining renovations scheduled to be finished by the end of the year. We’re proud to continue our relationship with UAB in designing spaces that empower our clients to bring innovation to the communities around us. The School of Optometry continues to distinguish itself as a top-tier program by providing state-of-the-art clinical practice and partaking in groundbreaking discoveries in vision science. Peruse the project page to read and see more about the 18,600 SF renovation: www.bpa.net/uab-school-of-optometry. And learn more about UAB's School of Optometry at their website: https://www.uab.edu/optometry/home/. Alicia Pughsley and Charlie Abram are two of Birchfield Penuel's prized emerging leaders--both of whom joined the BPA family upon completing their respective internships with us through Auburn University's Urban Studio. Both Alicia and Charlie lead by example with grace and a strength that does not command respect but receives very much of it nonetheless. This is Alicia's 10th year at BPA! Alicia was welcomed to BPA in 2008 and has, over the course of the last decade, grown from being the youngest ever licensed female architect in our office to being an completely invaluable Senior Associate! Alicia has also served AIA Birmingham's Executive Committee (EXCOM) for 8 years in several capacities: Councilor, First Year Director, Second Year Director, and currently as the Secretary. In the office, in addition to being a stellar project manager, Alicia serves as a member of BPA's Future Business Advisory Group - helping to usher in vision and strategy for our BPA family for years to come! Additionally, Alicia is the mama bear-captain-extraordinaire of our in-house Digital Marketing team. She has used her passion for design in all areas and skill to form our team and continues to lead our crew through always-developing and growing ideas and techniques! 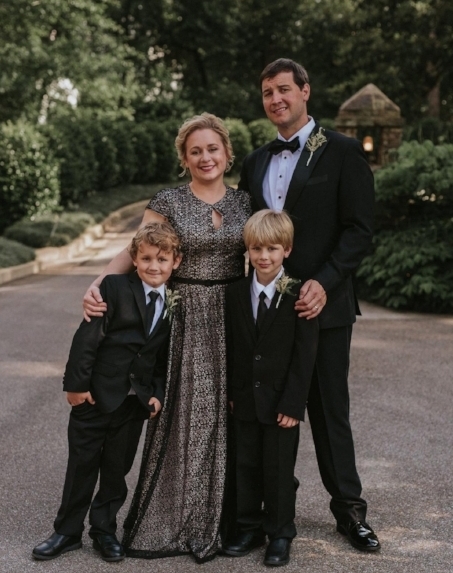 In the free time she has, Alicia is involved in her church, has a stationary company-side hustle, loves practicing her water coloring skills, and enjoys taking all three of her boys on adventures around the city, to the Birmingham zoo, or neighborhood park. "I love problem solving. Something about trying to figure out a problem or floor plan for a client is like a puzzle for me….and I love puzzles." "I decided to join the BPA team full time after my co-op with them during my time at Urban Studio. I loved the people. I instantly felt part of a team and a family. I also loved that I was included in project conversations and design from the start instead of being pigeon holed doing stair details." "I love going to various spots around town with my husband and two boys – whether it’s the zoo, the park, or various festivals and events. Birmingham always has something fun going on. I also love to take drawing and painting classes here in town when time allows." 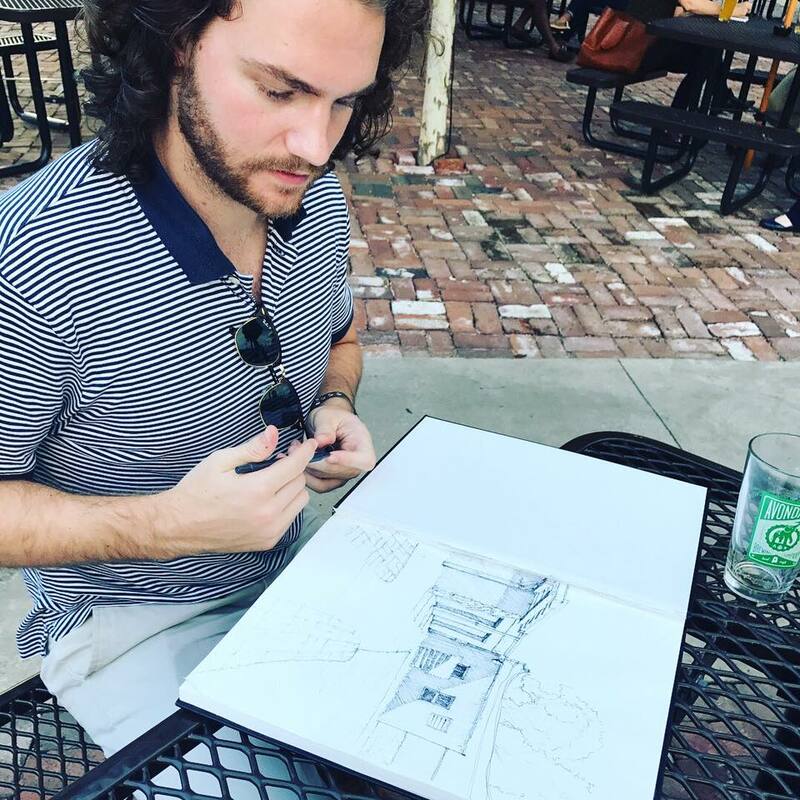 Charlie graduated from Auburn University's Urban Studio in 2015 and over his last 3-4 years at BPA has been a steady treasure - offering both dependable and inventive ideas and contributions on project teams and the variety of committees and groups he serves on. To play along with the 2016 election year, Charlie was elected as BPA's "Chief Intern." And while the title might be slightly in jest, his role is certainly not. Charlie keeps all of our BPA Emerging Professionals tethered to their goals of passing their respective ARE tests and meeting milestones for licensure while also encouraging their participation in the profession as a whole. Charlie serves in this capacity not only inside our office, but also within AIA Birmingham as Emerging Professionals (EP) Director. As the EP Director, his responsibilities include facilitating the development of the EPs and serving as an ambassador and liaison between the young professionals of the AIA and the broader organization. Don't let his exemplification of men's professional style confuse you, Charlie is an outdoor junkie. He loves to hike Ruffner and Red Mountain or go on an evening jog around Railroad park. Charlie is also very involved in his church community and can therefore be found around the city proselytizing about one of his three loves: Jesus, Birmingham, or Beyonce. “I love SO MANY things about BPA, but the thing I appreciate most is the opportunity and encouragement to cultivate the career I truly desire. It is very important for me to have balance between professional development and civic involvement. I’m able to pursue interests outside of the office [and the profession], without being expected to compromise my growth as an architect or the project teams I’m able to work on." "Since my first day at BPA, I have been encouraged to immerse myself into every project I have an opportunity to work on—whether it was going to last for 3 days or for 3 months. It became immediately apparent that new ideas were enthusiastically welcomed and were not considered a hindrance. Listing all of the things I learned during my Urban Studio co-op would take an extremely long time. But, the lasting impression that made me eager to return is just as true as it was three years ago: BPA believes that people are its greatest asset." "My absolute favorite thing about Birmingham is the prevalence of great outdoor spaces within quick access of downtown. My ideal Saturday includes a few hours with a great book, under a shady tree in Railroad Park." At BPA we believe our greatest asset is the people on our team. We pride ourselves on honing our design talents and empowering team members to grow as leaders during every phase of their respective careers. We’re extremely proud of Alicia and Charlie and grateful for the way they represent BPA so well! 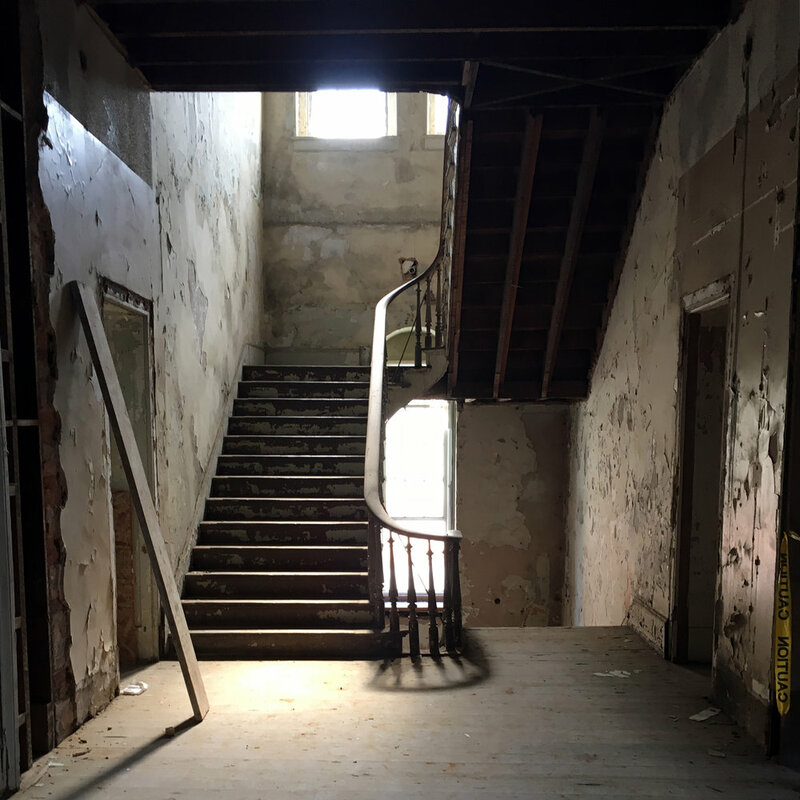 We can’t say much, but we couldn’t resist the opportunity to share some cool photos from this antebellum era structure. Be sure to come back to our blog or visit our social media accounts for more updates about this mysterious and exciting project! Allison Vosicky and Micah Martin are two of Birchfield Penuel's brightest and youngest talents--both of whom we first met at the Auburn University Internship Fair. Allison, a South Florida native, made her way to Birmingham after graduating in 2015. Micah, a Birmingham area local, grew up in Homewood and was excited to return to his old stomping grounds in 2016. Both Allison and Micah are excited about downtown Birmingham’s design renaissance and were drawn by the probability of working on projects that would make a lasting impact in the city. In their short time with BPA, they have distinguished themselves as emerging leaders and essential members of our internal Digital Marketing Team. As part of the Digital Marketing Team, she uses her interests in graphic design to distinguish herself as one of our social media experts—crafting many of our promotional images and marketing materials. Allison is also a member of our Future Business Advisory Group, whose role is to initiate and refine strategic visioning for the company. As the youngest member of this committee, she ensures that the forward progress of BPA keeps design professionals from all generations invested in future visioning. Outside of the office, Allison is an active member of several civic organizations including Junior League of Birmingham, AIA Birmingham, Sweetwater Outreach, and her local church. Being the youngest member on the Digital Marketing Team, he keeps the team relevant to what engages the youngest members of the design community. Over the past year, Micah has taken on the responsibility of ushering in a positive shift with our presentation graphics. In this role, he has exhibited great creativity with his intuitive sense about allowing the architecture to speak for itself. Micah has had the opportunity to work on projects for several of our high-profile and longest standing clients, such as UAB Health System and the University of Alabama. A self-proclaimed sports aficionado, he is always eager to discuss the highlights from yesterday’s sporting event. In his free time, Micah coaches youth soccer and is a member of an adult soccer league, himself. At BPA we believe our greatest asset is the people on our team. We pride ourselves on honing our design talents and empowering team members to grow as leaders during every phase of their respective careers. We’re extremely proud of Allison and Micah and grateful for the way they represent BPA so well! As we begin a new year, let's take a look back at the completion of the 2017 office renovations at the Mercedes-Benz plant in Vance, Alabama. With over 80,000 square feet already completed, we are proud to say we are currently under design and construction for several additional areas throughout the plant. Stay tuned in 2018 for more exciting updates! Each renovation begins with a conceptual idea that is conveyed through a sketch, thanks to our very own Wallace Williams! This allows us to convey our ideas to the client before we begin the construction documentation process. So far this has been well received and leaves each area with a piece of art to motivate them for the future! Birchfield Penuel reflects on an awesome 2017! See our work from this year and your role in it! As always we’re thankful for our amazing clients, consultants, staff and their families. BPA is excited to welcome designer, Cassandra Hopkins, back to our firm. Cassandra worked with us for several years before deciding to take some time off to care for her two boys. Now that her boys are back in school, she's decided to join us again, and we couldn't be more thrilled. What do you like to do in your free time/ what hobbies to you have? : As a mother of two boys, I don't really have a lot of free time. However, when I do find a spare minute, I love crafting, antique shopping, decorating for the holidays, and finding new uses for old things. What led you to pursue a career in design? : I love drawing, bringing new life to things, and space planning. 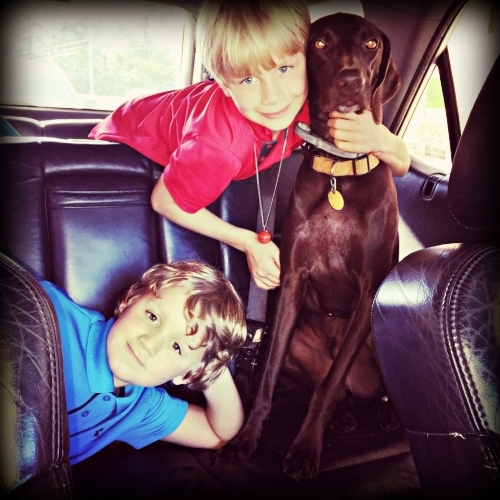 Fun facts: Mother to two boys (Judson, 8 and Carter, 6) and married 11 years to husband, Jeremy. I'm a Champion Scarecrow Builder and I love to listen to Christmas music year round. Birchfield Penuel and Associates wholeheartedly supports the efforts of the American Institute of Architects (AIA) and the International Interior Design Association (IIDA). Both the AIA and the IIDA advocate on behalf of their respective professions to the general public and work diligently to support their members throughout their careers. The majority of the design professionals at BPA are active participants in AIA and IIDA. We proudly recognize the standout members of the BPA family who currently hold board positions in these organizations. Alicia Pughsley, AIA, LEED AP, one of our senior associates, has served on AIA Birmingham's Executive Committee (EXCOM) for 8 years in several capacities: Councilor, Secretary, and currently as the First Year Director. In this role, she leads the chapter's effort on sponsorship and assists with the promotion of chapter events. In addition to her position on EXCOM, Alicia serves with AIA's non-profit extension, the Alabama Center for Architecture (ACFA) as the chair of their DreamArchitecture Birmingham committee. DreamArchitecture is an outreach program that inspires elementary school students to explore their curiosity about the design of the built environment. Charlie Abram, Assoc. AIA, one of our graduate architects, is serving his first term with EXCOM as the Emerging Professionals (EP) Director. As the EP Director, Charlie serves as an ambassador and liaison between the young professionals of the AIA and the broader organization. His responsibilities include facilitating the development of the EPs in their pursuit of licensure and encouraging their participation in both the AIA and the profession of architecture as a whole. Maria Glaser, RID, IIDA, LEED AP, one of our senior associates has served on the IIDA Alabama Chapter Board for 8 years as both a Professional Development Officer and an Executive Officer. In her role this year as President of the Chapter, she oversees all activities of the Chapter and acts as liaison to IIDA International. She has also been Chair of the Chapter's primary fundraising event, ARTrageous, for the past 6 years. Beneficiaries of the event include the IIDA Foundation and Studio By the Tracks. Melissa Porter, RID, IIDA, LEED ID+C, one of our associates has served on the IIDA Alabama Chapter Board for 3 years as both Director and Vice President of Communications. In this role she is responsible for Chapter communications, social media, and website maintanence. Laura Yeatman, RID, IIDA, LEED ID+C, one of our associates has served on the IIDA Alabama Chapter Board for 2 years, as Young Professionals Liaison and currently as Birmingham City Center Representative. In her current role, she coordinates City Center activities with the Executive Officers and committees. All of these individuals are leaders within our office, so it comes as no surprise to us that they have been chosen to serve with AIA and IIDA. We appreciate how they represent BPA well and positively influence the design profession of Birmingham. We're excited to have our Fall Architectural Intern with us from Auburn University's Urban Studio. JD is a 5th year Architecture student from Lilburn, Georgia and will be with us for the Fall semester. What’s one thing you’ve learned in Architecture school: When faced with a seemingly insurmountable problem, just start drawing! Birchfield Penuel & Associates proudly announces Alicia Pughsley, AIA, LEED AP, as Senior Associate and Laura Yeatman, NCIDQ, IIDA, LEED GA, as Associate! Alicia received her Bachelor’s in Architecture from Auburn University and is a registered architect in the state of Alabama. Alicia came to BPA while studying at Auburn’s Urban Studio program and has been an indispensable member of our team ever since. Her positive attitude and determined work ethic have earned her a role as a dynamic young leader in our firm. Her technical proficiency and design talent have equipped her to serve some of our largest and oldest clients. On top of that, she has managed a team that has overhauled our web and social media presence. She continues to invest in the broader profession of architecture by serving on the Executive Board of the Birmingham chapter of AIA. We are so proud of Alicia, the work that she’s done, and the leader she’s become. We’re excited to announce her as the newest Senior Associate on our team. Laura Yeatman received her Bachelor of Science in Interior Design from Auburn University and is a registered interior designer in the state of Alabama and a LEED Green Associate. Since coming to BPA, Laura has been a force behind some of our most exciting projects and new client relationships. Her experience in both healthcare and corporate interiors are allowing us to expand further into those markets than ever before. Laura is also heavily involved in growing the local design community. She is currently serving as the Director of Birmingham City Center on the Executive Board of the Alabama chapter of IIDA. Laura is part of an exciting new era in our firm and we are pleased to announce her as the latest addition to our team of Associates. Last month, Pam Lowery of BPI invited some of the BPA interior designers to make a trip to Schluter Systems’ North American headquarters in Montreal, Canada. Schluter Systems hosted a workshop to discuss the challenges in traditional floor, wall, and exterior tile applications as well as new technologies available to address these issues. Working sessions and seminars were given throughout the visit with topics covering building efficiency and LEED, tile installations, proper drain installation, water-proofing and moisture management. The ladies also made time to explore the cultural gem that is Quebec’s most populous city. They enjoyed a dining cruise on Le Bateau-Mouche down the St. Laurent River and under the Jacques Cartier Bridge, a walking tour of Old Montreal and the Port, a tour of Le Notre Dame cathedral, and a visit to world-famous Gibby’s Steakhouse. A special thank you to Steve Brasington and William LeBlanc from Schluter Systems for graciously hosting the visit and to Pam for coordinating the festivities! After our addition of the Ambulatory Surgery Center at Saint Vincent's One Nineteen, we were tasked with dreaming up a sacred space for the One Nineteen campus to connect the existing wellness facility and the new Surgery Center. We held collaborative charettes with healthcare providers and caregivers that serve the ministry, and as a product of these work sessions, came up with the idea for the Sisters Garden. Our goal was to develop a space that welcomed growth, sharing, renewing of the inner life, persistence of purpose and reminding us of the spiritual presence in all of creation. The St. Vincent’s One Nineteen Sisters Garden is a sequence of outdoor spaces designed as a fundamental component of the St. Vincent’s Health System’s Healing Ministry. This sacred space constitutes a meditative garden and labyrinth, ethereal canopy and intimate gathering spaces. The design underscores the physical and spiritual centrality of the project. Each detail element reinforces the concept of suspension between introspection and outward engagement. Cedar screens shelter visitors, patients and caregivers alike, while maintaining a visual connection to their surroundings. A translucent canopy arcs across the space, drawing passers-by into a moment of rest and contemplation. Welcoming Jennifer Smoke for the Summer! We're happy to have Jennifer Smoke back with us this summer as an Architectural Intern! Jennifer is a rising 5th year at Auburn University and worked with us a few summers ago when she was a second year student. Jennifer is a native of Birmingham and loves being able to be a part of the great design going on in the city while she's home on summer break. - Jennifer is a dance minor! And studies dance when she's not slaving away in the architecture studio. - Her default hair style is an afro! - She once worked at a sushi restaurant - so we will all be trying to glean sushi knowledge from her. 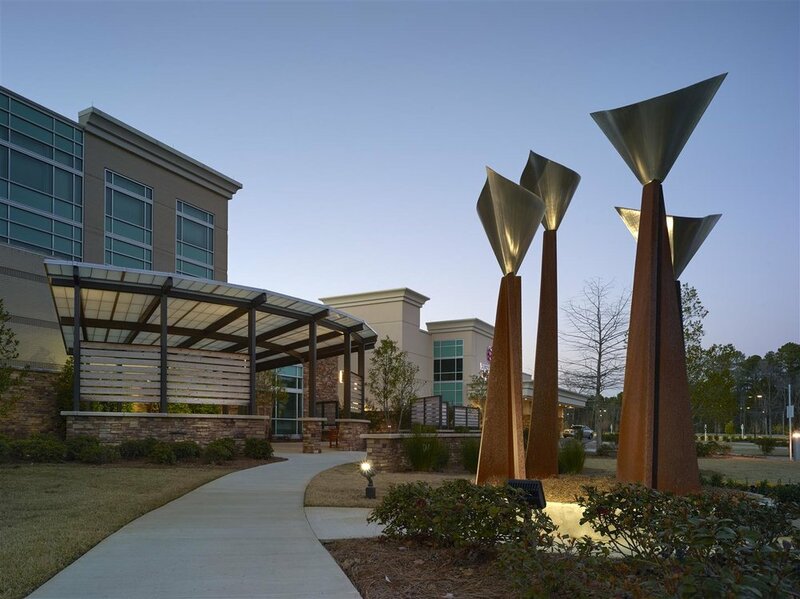 The 2017 IIDA Alabama Chapter IDIE Awards lived up to its Rock and Roll theme this year, from the venue to the trophies. The twelfth biennial event held this year at Iron City hosted over 325 attendees, including Educators, Students, Interior Designers, Architects, and Vendors, and as well as clients who’s projects were being honored. Birchfield Penuel was proud to be represented in two categories: Best Of Corporate – Large for Mercedes-Benz U.S. International, Best of Healthcare – Large for New Western Health Center for Jefferson County and St. Vincent’s Chilton Hospital. Each firm represented was also invited to create an album cover to be used in the program. Although no official award was given for Best Album Cover, BPA's was chosen as the overall favorite! Congratulations to all the winners and thanks to the 2017 IDIE Awards Committee! Easter Egg Hunt ..on our website!